RadioSpirits.com - Wyllis Cooper's Quiet, Please! That sound you hear? 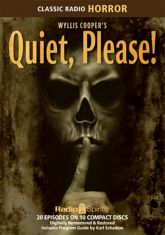 It's your own heart -- pounding with excitement as you enter the imaginative world of radio suspense-master Wyllis Cooper in Quiet, Please! These unique and compelling journeys into the macabre are hosted by Ernest Chappell. Once again, these digitally restored and remastered episodes are available from Radio Spirits. This CD re-release of our long out of print cassette collection includes two additional episodes and a Program Guide by Karl Schadow.